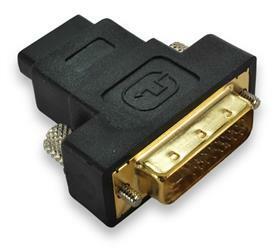 Use these handy adapters to connect between DVI and HDMI video equipment. One end of the adapter contains a DVI-D Dual Link Male (24+1) connector, and the other end contains an HDMI Female connector. The adapter ends are pictured below.